SUICIDE SQUAD 0...NM-...2012...Adam Glass...Fernando Dagnino...Bargain! Suicide Squad #0 (DC 2012) A cover. High grade condition. 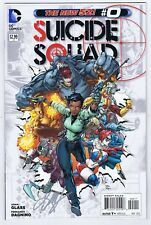 Suicide Squad #6-7 Set (2012, DC) New 52 Origin of Harley Quinn! "Key"!!!! !